KEY CONCEPTS: Science and robotics. 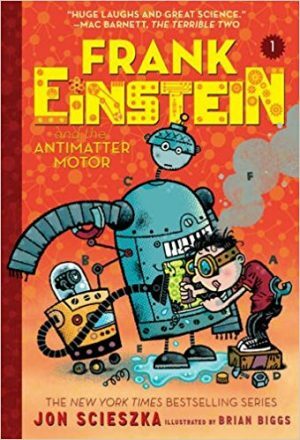 DESCRIPTION FROM THE PUBLISHER: Kid-genius and inventor Frank Einstein loves figuring out how the world works by creating household contraptions that are part science, part imagination, and definitely unusual. In the series opener, an uneventful experiment in his garage-lab, a lightning storm, and a flash of electricity bring Frank’s inventions—the robots Klink and Klank—to life! Not exactly the ideal lab partners, the wisecracking Klink and the overly expressive Klank nonetheless help Frank attempt to perfect his inventions.. . . until Frank’s archnemesis, T. Edison, steals Klink and Klank for his evil doomsday plan!